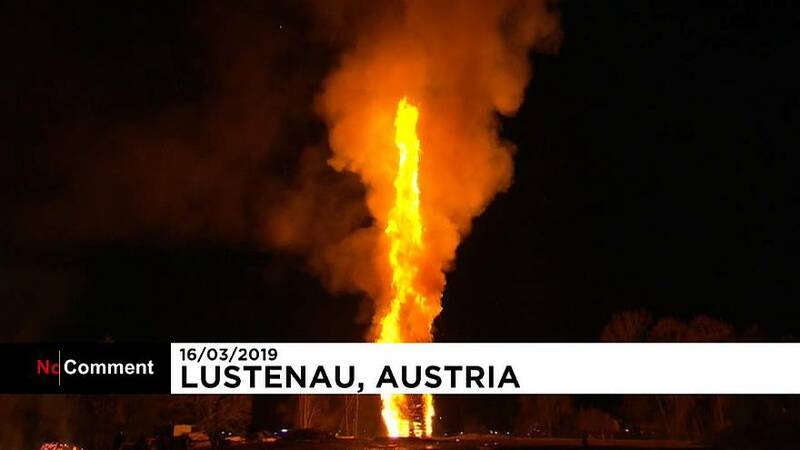 The world record was set for the tallest bonfire in Lustenau in Vorarlberg, Austria. It was 50 metres high and was made with 100 tonnes of wood. But when it was lit, parts started flying towards the audience so the fire brigade closed some areas off. To mark Chinese President Xi Jinping's visit to Europe next week, a farmer and land artist used his tractor to plough a huge portrait of the leader in northern Italy. The artist hopes Xi will fly over his masterpiece. In Russia, aviation personnel at the Oreshkovo airfield have raised and made friends with a rescued bear. The now three-year-old animal weighs about 250 kilograms and can easily overpower any human. In Australia, an unwelcome but adorable intruder refused to leave a car. The Koala clung stubbornly to the dashboard but was eventually persuaded to leave. And a less cute intruder was found in Texas. A homeowner reported seeing "a few snakes" under his home and called a snake removal company. But it turned out a total of 45 rattlesnakes were living under his house, which were removed last week.